I call Mark Elliott at International Yacht Collection find out more details of his new central agency for sale, CRN's 40m Aqualibrium and he tells me that "She's a stunning yacht in immaculate condition. She has the lifestyle and feel of a 50m yacht for the price and economy of a 40 metre." Built to Lloyds class in 1995 and refitted in 2004, she has a long range and shallow draught, while accommodation includes a master on the main deck, two doubles and two twins. 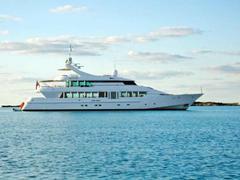 Not for sale to US residents while in US waters, Aqualibrium is asking $12.9 million.